It’s been quite a busy month! 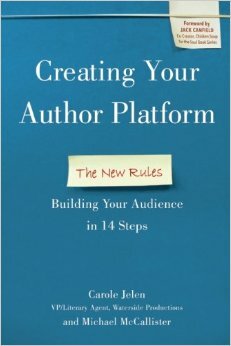 Carole Jelen and I finished the latest round of edits of our BenBella Book Creating Your Author Platform: The New Rules last week, and that’s off to our copy editor. I’m working on a site (WordPress, of course) where you can learn more about the book; watch this space for launch information. You’ll be seeing the book itself at your favorite brick-and-mortar bookstore on May 13, 2014, but you can pre-order it online at this very moment! My wonderful literary agent and co-author, Carole Jelen also gave an “Agent Advice” interview to WritersDigest.com on author platform topics and other tips of the publishing trade. Now I can refocus energy on the next project, my guide to the Ubuntu Touch phone and tablet operating system. While still not pre-installed on any device, you’ll be able to run Touch on a whole raft of phones when the platform is released on October 17. See the Ubuntu Phone site for details. I’ll be ramping up the “Notes from the Ubuntuverse” section of this site soon too. BarCamp Milwaukee 8 is this Saturday, October 5 in the historic John Plankinton Building in downtown Milwaukee. Go register now, and I’ll see you there! If you need to know more, our fearless leader explains it to you here.